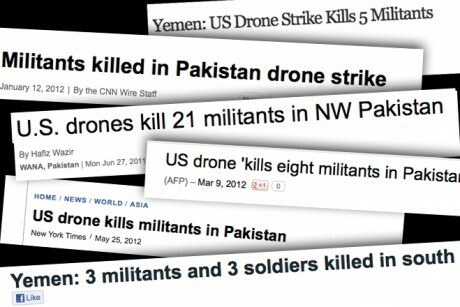 Glenn Greenwald has two must-read posts on the reason that virtually everyone the U.S. kills is called a “militant” or “suspected militant”. In 2006, the pro-Israel activist Alan Dershowitz created a serious scandal when he argued – mostly in order to justify Israeli aggression — that “civilian causalties” are a “gray area” because many people in close proximity to Terrorists — even if not Terrorists themselves — are less than innocent (“A new phrase should be introduced into the reporting and analysis of current events in the Middle East: ‘the continuum of civilianality’ . . . . Every civilian death is a tragedy, but some are more tragic than others”). Even more repellent was John Podhoretz’s argument in 2006 that “the tactical mistake” which “we made in Iraq was that we didn’t kill enough Sunnis in the early going to intimidate them and make them so afraid of us they would go along with anything,” specifically that the real error was that the U.S. permitted “the survival of Sunni men between the ages of 15 and 35.” In other words, “all military-age males” in Sunni areas should have been deemed “combatants” and thus killed. Podhoretz’s argument created all sorts of outrage in progressive circles: John Podhoretz is advocating genocide! But this is precisely the premise that President Obama himself has now adopted in order to justify civilian deaths and re-classify them as “militants.” Here is the rationale of Obama officials as described by the NYT: “people in an area of known terrorist activity, or found with a top Qaeda operative, are probably up to no good.” Probably up to no good. That’s a direct replica of Dershowitz’s argument, and is closely related to Podhoretz’s. They count someone as a “militant” — worthy of death — based purely on the happenstance of where they are and the proximity they’re in to someone else they suspect is a Bad Person. If such a person is killed by a U.S. missile, then, by definition, they are “militants,” not “civilians” — even if we don’t know the first thing about them, including their name. Will This Policy Apply to Americans On U.S. Soil? This may sound like something far away which won’t directly affect Americans. FBI Director Robert Mueller on Wednesday said he would have to go back and check with the Department of Justice whether Attorney General Eric Holder’s “[criteria] for the targeted killing of Americans also applied to Americans inside the U.S.
“I’m going to defer that to others in the Department of Justice,” Mueller replied. Indeed, Holder’s Monday speech at Northwestern University seemed to leave the door open. One would hope that the FBI Director would have a handle on a few details guiding his responsibilities, including whether he can kill citizens without a charge or court order. The claim that they are following self-imposed “limits” which are meaningless — particularly in a system that is premised on the availability of judicial review. The Administration has never said that the [Law Of Armed Conflicts] does not allow the same powers to be used in the United States. It would be an easy thing to state. Holder can affirmatively state that the President’s inherent power to kill citizens exists only outside of the country. He can then explain where those limits are found in the Constitution and why they do not apply equally to a citizen in London or Berlin. Holder was not describing a constitutional process of review. They have dressed up a self-imposed review of a unilateral power as due process. Any authoritarian measure can be dressed up as carefully executed according to balancing tests, but that does not constitute any real constitutional analysis. It is at best a loose analogy to constitutional analysis. When reporters asked the Justice Department about Mueller’s apparent uncertainty, they responded that the answer is “pretty straightforward.” They then offered an evasive response. They simply said (as we all know) that “[t]he legal framework (Holder) laid out applies to U.S. citizens outside of U.S.” We got that from the use of the word “abroad.” However, the question is how this inherent authority is limited as it has been articulated by Holder and others. What is the limiting principle? If the President cannot order the killing of a citizen in the United States, Holder can simply say so (and inform the FBI Director who would likely be involved in such a killing). In doing so, he can then explain the source of that limitation and why it does not apply with citizens in places like London. What we have is a purely internal review that balances the practicality of arrest and the urgency of the matter in the view of the President. Since the panel is the extension of his authority, he can presumably disregard their recommendations or order a killing without their approval. Since the Administration has emphasized that the “battlefield” in this “war on terror” is not limited to a particular country, the assumption is that the President’s authority is commensurate with that threat or limitless theater of operation. Indeed, the Justice Department has repeatedly stated that the war is being fought in the United States as well as other nations. Thus, Mueller’s uncertainty is understandable . . . and dangerous. The Framers created a system of objective due process in a system of checks and balances. Obama has introduced an undefined and self-imposed system of review …. Remember, government officials have said that Americans can be targets in the war on terror. Obama and Bush … both say we are in a war not confined to particular battlefield. … Both say we can target citizens without judicial oversight and that can happen anywhere in the world. Indeed, the Army is already being deployed on U.S. soil, and the military is conducting numerous training exercises on American streets. And see this. And the numerous drones flying over American soil – projected by the FAA to reach 30,000 drones by 2020 – are starting to carry arms. Of course, America has been in a continuous declared state of national emergency since 9/11, and we are in a literally never-ending state of perpetual war. See this, this, this and this. And the government has basically announced that it can label any American citizen a terrorist for no reason whatsoever. So if a military-age man is killed in a U.S. city because he happens – even unknowingly – to be near a suspected bad guy, will the report simply read “another militant killed”?